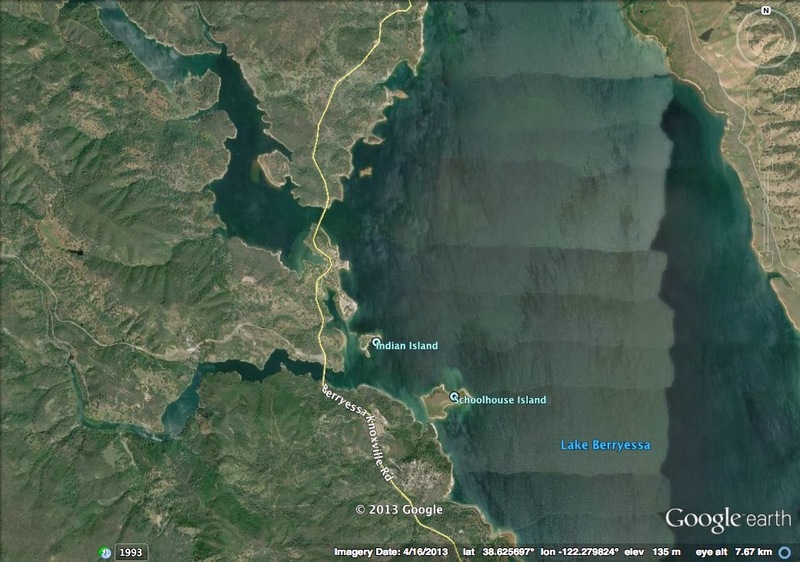 Lake Berryessa was formed by damming Putah Creek (a three span stone arch bridge is submerged under the lake). We have previously followed Putah Creek through Yolo County. To the west in Napa County the creek is larger, and it has formed one of the largest reservoirs in California (see photo below). The bridges cross on the west side where Putah and Pratt Creek empty into the lake. The Knoxville-Berryessa Road Bridge (21C0014) across Putah Creek is a six span steel girder bridge on two column bents. Its 818 ft long (with a 166 ft long main span), 24 ft wide, and built in 1957. The Knoxville-Berryessa Road Bridge (21C0013) across Pratt Creek is a four span steel girder bridge on two column bents and pile extension approach spans. This bridge is 703 ft long (with a 166 ft long main span), 24 ft wide, and built at the same time as the bridge to the north was built. Napa County, California Bridges: Lake Berryessa Bridges by Mark Yashinsky is licensed under a Creative Commons Attribution-NonCommercial-NoDerivatives 4.0 International License.